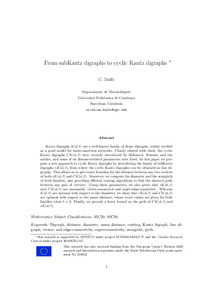 Kautz digraphs K(d,l) are a well-known family of dense digraphs, widely studied as a good model for interconnection networks. Closely related with these, the cyclic Kautz digraphs CK(d,l) were recently introduced by Böhmová, Huemer and the author, and some of its distance-related parameters were fixed. In this paper we propose a new approach to cyclic Kautz digraphs by introducing the family of subKautz digraphs sK(d,l), from where the cyclic Kautz digraphs can be obtained as line digraphs. This allows us to give exact formulas for the distance between any two vertices of both sK(d,l) and CK(d,l). Moreover, we compute the diameter and the semigirth of both families, also providing efficient routing algorithms to find the shortest path between any pair of vertices. Using these parameters, we also prove that sK(d,l) and CK(d,l) are maximally vertex-connected and super-edge-connected. Whereas K(d,l) are optimal with respect to the diameter, we show that sK(d,l) and CK(d,l) are optimal with respect to the mean distance, whose exact values are given for both families when l = 3. Finally, we provide a lower bound on the girth of CK(d,l) and sK(d,l) Kautz digraphs K(d,l) are a well-known family of dense digraphs, widely studied as a good model for interconnection networks. Closely related with these, the cyclic Kautz digraphs CK(d,l) were recently introduced by Böhmová, Huemer and the author, and some of its distance-related parameters were fixed. In this paper we propose a new approach to cyclic Kautz digraphs by introducing the family of subKautz digraphs sK(d,l), from where the cyclic Kautz digraphs can be obtained as line digraphs. This allows us to give exact formulas for the distance between any two vertices of both sK(d,l) and CK(d,l). Moreover, we compute the diameter and the semigirth of both families, also providing efficient routing algorithms to find the shortest path between any pair of vertices. Using these parameters, we also prove that sK(d,l) and CK(d,l) are maximally vertex-connected and super-edge-connected. Whereas K(d,l) are optimal with respect to the diameter, we show that sK(d,l) and CK(d,l) are optimal with respect to the mean distance, whose exact values are given for both families when l = 3. Finally, we provide a lower bound on the girth of CK(d,l) and sK(d,l). Dalfo, C. "From subKautz digraphs to cyclic Kautz digraphs". 2017.